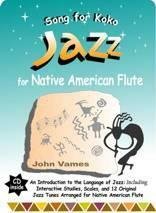 For all of you who want to journey further into the world of music and the magic of the Native American flute by improvising in Jazz style this book is for you. An introduction to the language of jazz this 74 page book offers four easy to follow lessons, practice scales, 12 exercises to improve your playing, 12 original jazz tunes arranged for Native American Flute, and an interactive 44 track audio CD demonstrating it all. I have invested alot of money in my Native American Flutes, some I have purchased through the Oregon Flute Store , recently I purchased a Honker Flute case by Laughing Mallard and if you are as serious about protecting your investment then I strongly urge you to do as I did and purchase a Flute Case by Laughing Mallard. Well constructed , by far the best I have seen. As a performer I need not worry about getting my Flutes from show to show without worry about getting banged up, The Honker Does the job.